Eben Adams is the Chair of Pierce Atwood's Real Estate Practice Group. Eben's practice includes all aspects of real estate law with a focus on commercial and residential development, acquisitions, sales and leasing. Eben regularly represents hospitality clients in the purchase and sale of restaurants and hotels. Eben has extensive experience representing developers of condominium projects including residential, commercial and mixed-use condominiums. Eben regularly assists energy companies with real estate matters including wind power leases and the acquisition and development of transmission corridors. Eben is experienced in restructuring workouts of distressed commercial and residential real estate projects, including condominiums. Prior to joining Pierce Atwood in 2000, Eben served as a law clerk to the United States District Court Judge Gene Carter. Previously, Eben served for four years as a legislative assistant to U.S. Senator William S. Cohen in Washington, D.C. 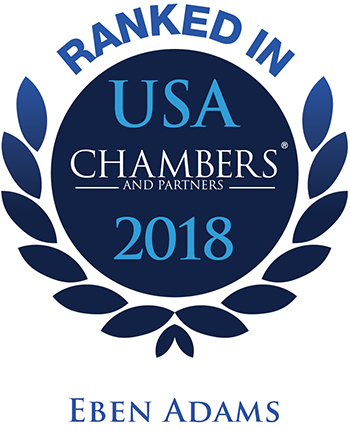 Listed in The Best Lawyers in America® since 2010 and in Chambers USA for Real Estate Law. Worked with regional real estate company in the redevelopment of several former commercial properties on midcoast Maine, including the conversion of a former mill to a mixed-use residential and commercial condominium. Represents franchisee of a national food franchise in all aspects of development, leasing, acquisition, and financing. Working with utility company in a major expansion of several hundred miles of existing utility corridors. Chambers reports that one client describes practice group chair Eben Adams as "tactically very strong and very responsive." Eben's practice focuses on commercial and residential development, acquisition, and leasing, and he is particularly experienced in matters concerning condominiums.